Where do I enter the licence number ? Make sure you update the device settings by clicking “Update”. The hardware requirements for ERP-Scale are the same as for the SAP GUI. We want to use ERP-Scale in a custom transaction, how do we start? 1. Create a test ABAP in your SAP system using our sample code. 6. Configure the device communication settings. Contact us for further assistance with the manufacturer and model of the scale. 7. Define the data parsing settings. Contact us for further assistance with the manufacturer and model of the scale. 8. Order a trial licence for ERP-Scale (free of charge). 9. If communication with SAP fails, check SAP security settings. Our tutorial video covers these steps. Our TCPautoresponder is ideal for use during the development phase of your project. Typically, ERP-Scale is installed on the PC that the operator is using to run the SAP Packing Station transaction, and the weigh-scale is connected to the same PC using a serial interface. ERP-Scale can also be used for custom developments, for example to integrate weigh bridges or cubing devices. ERP-Scale can also interface with weighing equipment via the Ethernet using TCP or UDP protocols. This is especially useful when using Serial to Ethernet Device Servers. In this case, ERP-Scale can be installed as a server process. ERP-Scale supports central management, and all configuration functions and monitoring tasks can be performed remotely. The central ERP-Scale communications engine runs as a windows service in the background. Where do I download the full version ? There is no “full version” of ERP-Scale. When you download and install ERP-Scale, it will initially run in “Test-mode”. Test mode has the full functionality of the licensed version. The only difference is that the output to SAP is “scrambled”. Trial licences unlock the full functionality of ERP-Scale and are ideal for use during the development phase of your project. Trial licences are available from here free of charge. Once you have received your licence numbers, you can activate ERP-Scale. Please follow the instructions here. 1. Copy LIBRFC32.DLL to windows32. 2. Update the services file with the entries for sapgwxx. If you do not have a physical scale to test ERP-Scale with, you can use our TCP Auto Responder to generate data for testing. Firstly, download the PP-TcpAutoResponder from here. In Trial Mode, using HUPAST, will we be able to get the weight from the Scale Server? In trial mode, ERP-Scale is fully functional. The only difference between running in “Trial Mode” and “Licence Mode” is that the weight returned to SAP has the digits scrambled, i.e. 123456 will become 432516, or 325164 etc. Note: If you are using a trial licence, the full functionality of ERP-Scale is unlocked. If you are not able to return a weight to SAP transaction HUPAST using ERP-Scale in “Trial-Mode”, you should review your RFC destination in SAP and the details entered in ERP-Scale. 1. 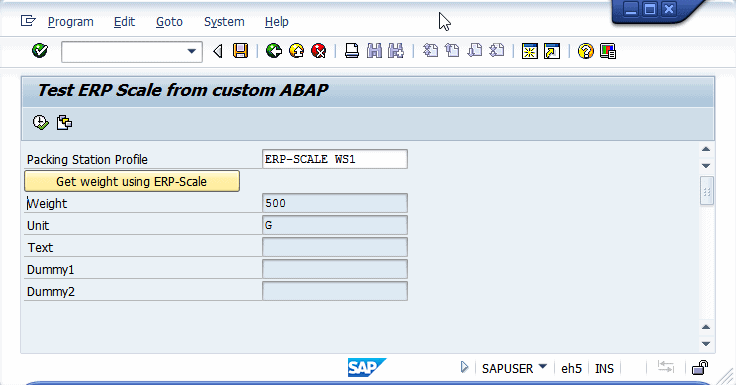 After creating the RFC destination in the ERP-Scale configuration utility, did you stop and restart the SapScaleServer (by clicking on “Restart” in the configuration utility)? 2. Can you please send a screen dump of the ERP-Scale configuration utility showing the RFC destinations. 3. Can you please activate logging in the SapScaleServer, restart the SapScaleServer and after about 5 minutes send us the log. Click here for further details. 4. Is the SAP GUI installed on the PC where ERP-Scale is installed? 5. Please send us a screen dump of the RFC destination from SM59. 250 MB of available disk space for the fully-installed application. ERP-Scale integrates weighing scales with the S/4HANA packing station transaction and SAP ODA under S/4HANA. We have also created a prototype weighing bar within a PI-Sheet under S4/HANA. Will we be able to use this software to have the scale update QM Results recording in SAP? ERP-Scale supports the QM-IDI interface for use with QM transactions including QE51N. Can I purchase licences for ERP-Scale using a company purchase order ? Yes, a company purchase order can be used for purchasing ERP-Scale licences. Please contact us with your licence requirements and we will send you a quotation. Where can we purchase licences ? Licences can be purchased via FastSpring using a company payment card or directly from us with a company purchase order. Further details can be found on our licensing page.